How about being on a trip from Ahmedabad to Bhavnagar this weekend? If you have never been to the cultural city of Bhavnagar, then you must visit this wonderful place dotted with palaces, temples and gardens. You also have the opportunity to read some ancient texts at its huge library. Located to the west of Gulf of Khambhat, Bhavnagar has always been popular for its industries since its outset. Founded by Bhavsinhji in 1724, it was a princely state and the major political centre in Gujarat at that time. Today, it is one of the fastest developing cities and hence, is home to several industries. With hot and dry summers, Bhavnagar experiences a semi-arid climate; hence, it advisable to avoid visiting Bhavnagar during the summer season. Plan a trip to Bhavnagar during the winter season from October until the end of March, as during this period the climate is pleasant and cool letting you explore the town comfortably. By Air: You can take a direct flight from Ahmedabad to Bhavnagar. By Rail: There are direct trains available from Ahmedabad to Bhavnagar. You can catch a train from Ahmedabad railway station to Bhavnagar Junction. By Road: Bhavnagar is easily accessible by road from all the nearby cities and towns. If you travelling on your own, then take the following routes. However, route 1 is preferable as you can reach your destination within minimum time. En route to Bhavnagar, you can take a break at Dholera and explore its age-old beauty. Dholera is a small town located in the Ahmedabad district of Gujarat and is known for one of the originally built Swaminarayan temples which has become synonymous to the town. Nestled in the Gulf of Khambhat, Dholera is an ancient port city and is one of the fastest developing towns in the Ahmedabad district. 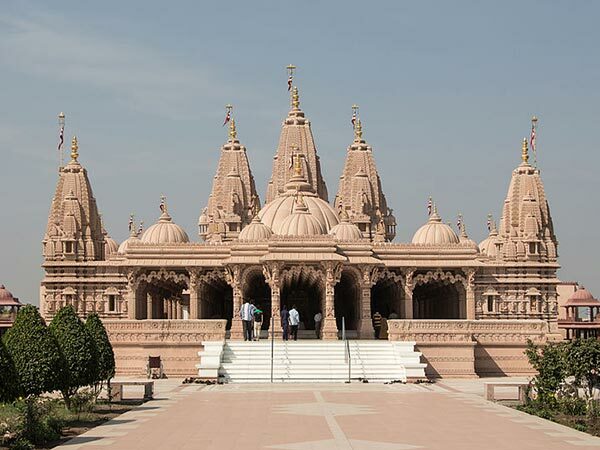 If you are around this small town, then do not forget to visit its Swaminarayan Temple. After an approximate journey of 3 hr, you will reach your destination. Once you are inside the boundaries of Bhavnagar, you visit the following places and discover the centuries-old complexes of Bhavnagar. Nilambagh Palace is one of the oldest palaces in Gujarat and is the residence of the maharaja of Bhavnagar. Beautifully built, Nilambagh Palace is definitely a must-visit place is Bhavnagar if you love exploring heritage sites. Even though a certain part of this palace is now serving as a heritage palace hotel, it still attracts several explorers and history lovers towards it. So, why not take a look at the magnificence of Nilambagh Palace? You can also visit Bhav Vilas Palace, which is famous for its wildlife collection and Mangalsinhji Mahal Palace, which is the residence of the royal family of Bhavnagar. One of the most famous temples in Bhavnagar is Takhteshwar Temple which is believed to be built at the end of the 19th century and is more than 120 years old. This beautiful temple situated atop a high platform is made out of white marble and is dedicated to Lord Shiva. During the festival of Shivaratri, you can find thousands of Hindu devotees coming here with offerings to pay their respects. How about being inside the compound of Takhteshwar Temple and gazing at its architectural beauty? Another tourist attraction in Bhavnagar is Swaminarayan Temple which is a newly formed temple and is the known for its splendid beauty amidst the greenery of trees and gardens. It is also popular amongst tourists for its structural beauty. How about resting under the peaceful shades of this marvellous temple? Being one of the oldest libraries in Gujarat, Barton Library is one of the major attractions in Bhavnagar for all readers and book lovers. Ranging from ancient texts on the evolution of India to books on several fields of science, you can find thousands of books shelved in the calm aura of Barton Library. It is a two-storeyed building with beautiful arches made out of stone which certainly reflect the beauty of the architectural work.